Objectives: Advanced tumor disease and metastatic spinal cord compression (MSCC) are two entities with a high impact on patients' quality of life. However, prognostic factors on the outcome after primary decompressive surgery are less well-defined and not yet standardized. The aim of this review was to identify prognostic variables that predict functional or ambulatory outcomes in surgically treated patients with symptomatic MSCC. 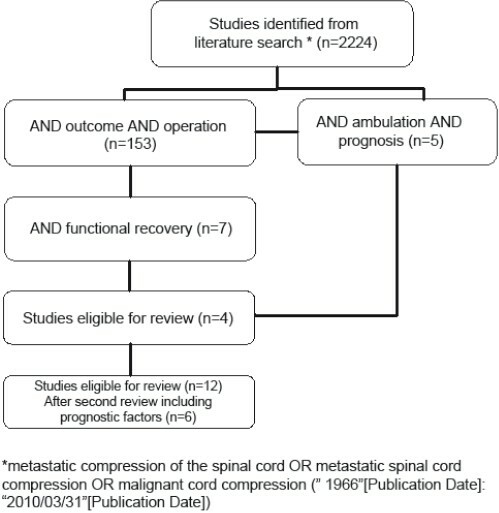 Materials and Methods: We conducted MEDLINE database searches using relevant keywords in order to identify abstracts referring to prognostic factors on ambulatory outcomes in surgically treated MSCC patients. Details of all selected articles were assembled and the rates of ambulation were stratified. Results: Evidence from five retrospective comparative trials and one observational prospective study summarizes different prognostic factors with a positive or negative influence on postoperative ambulatory status. Ambulatory patients maintaining ambulation status after decompression of the spinal cord constituted 62.1%. The overall rate of MSCC patients losing the ability to ambulate was 7.5% compared to 23.5 % who regained ambulation. Preoperative ambulation status, time to surgery, compression fracture and individual health status seem to be the most relevant prognostic factors for ambulatory outcome. Conclusions: There is a lack of standardized prognostic tools which allow predicting outcome in surgically treated patients. A quantitative score consisting of reliable prognostic tools is essential to predict loss and/or regain of ambulation and requires validation in future prospective clinical trials. Tuberculosis of the spine is one of the most common spine pathology in India. Over last 4 decades a lot has changed in the diagnosis, medical treatment and surgical procedures to treat this disorder. Further developments in diagnosis using molecular genetic techniques, more effective antibiotics and more aggressive surgical protocols have become essential with emergence of multidrug resistant TB. Surgical procedures such as single stage anterior and posterior stabilization, extrapleral dorsal spine anterior stabilization and endoscopic thoracoscopic surgeries have reduced the mortality and morbidity of the surgical procedures. is rapidly progressing. It is a challenge to treat MDR-TB Spine with late onset paraplegia and progressive deformity. Physicians must treat tuberculosis of spine on the basis of Culture and sensitivity. Foramen magnum (FM) lesions represent some of the most complex cases for the modern neurosurgeon because of their location near vital brainstem structures, the vertebral arteries, and lower cranial nerves. In particular, anterior or anterolaterally located FM tumors have traditionally been most difficult to resect with high morbidity and mortality resulting from approaches through the posterior midline or transorally. For many neurosurgeons, the far lateral, extreme lateral approach, and more recently, endoscopic endonasal approaches have become the preferred modern methods for the resection of anterior or anterolateral FM tumors. In this review, we examine both operative and non-operative approaches to FM tumors, including surgical anatomy, surgical technique, and indications for operative intervention in these complex cases. In addition, we compared outcomes from prior series. Background: Although adhesive arachnoiditis of the spinal cord can cause progressive symptoms associated with syringomyelia or myelomalacia, its surgical resolution based on the imaging diagnosis is not well characterized. This study aims to describe the use of imaging for the diagnosis of focal adhesive arachnoiditis of the spinal cord and its surgical resolution using microsurgical arachnoidolysis. 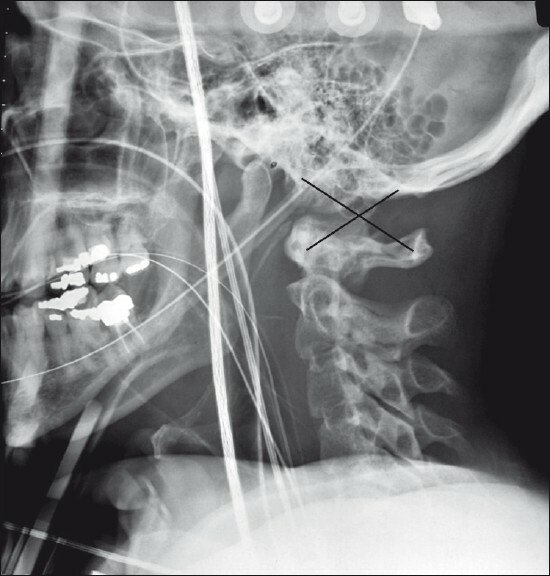 Materials and Methods: Four consecutive patients with symptomatic syringomyelia or myelomalacia caused by focal adhesive arachnoiditis underwent microsurgical arachnoidolysis. Comprehensive imaging evaluation using constructive interference in steady-state (CISS) magnetic resonance imaging (MRI) or myelographic MR imaging using true fast imaging with steady-state precession (TrueFISP) sequences was included before surgery to determine the surgical indication. Results: In all four patients a focal adhesion was identified at the cervical or thoracic level of the spinal cord, a consequence of infection or trauma. Three patients showed modest or minor improvement in neurological function, and one patient was unchanged after surgery. The syringomyelia or myelomalacia resolved after surgery and no recurrence was noted within the follow-up period, which ranged from 5 months to 30 months. Conclusions: MRI diagnosis of focal adhesive arachnoiditis is critical to determine the surgical indication. Microsurgical arachnoidolysis appears to be a straightforward method for stabilizing the progressive symptoms, though the procedure is technically demanding. Background: There have been few reports on the use of recombinant human bone morphogenetic protein (rhBMP)-2 in posterior spine. However, no study has investigated the dosing, safety, and efficacy of its use in the posterior atlantoaxial, and/or craniovertebral junction. Recent case report of the cytokine-mediated inflammatory reaction, following off label use of rhBMP-2 as an adjunct for cervical fusion, particularly in complex cases, has increased concern about complications associated with the product. Objective: To assess the safety, efficacy, and dosing of rhBMP-2 as an adjunct for instrumented posterior atlantoaxial and/or craniovertebral junction arthrodesis. Materials and Methods: We included all patients treated by the senior author that included posterior atlantoaxial and/or craniovertebral junction instrumented fusion using rhBMP-2 from 2003 to 2008 with a minimum two year follow-up. Diagnosis, levels fused, rhBMP-2 dose, complications, and fusion were assessed. Results: Twenty three patients with a mean age of 60.9 years (range 4 - 89 years) and an average follow-up of 45 months (range 27 to 84 months) met inclusion criteria. The indications for surgery included, atlantoaxial instability (n = 16), basilar invagination (n = 6), and kyphoscoliosis (n = 1). The specific pathologic diagnosis included type 2 dens fracture (n = 7), complex C1 and C2 ring fracture (n = 2), chordoma (n = 2), degenerative/osteoporosis (n = 3), rheumatoid disease (n = 8), and pseudogout (n = 1). The average rhBMP-2 dose was 2.38 mg/level, with a total of 76 levels treated (average 3.3 levels, SD= 1.4 levels). There were no complications. During the most recent follow-up, all patients had achieved fusion. Conclusions: In a series of patients with complex pathology and/or rheumatoid arthritis, 100% fusion rate was achieved with adjunct use of rhBMP-2, with a safe and effective average rhBMP-2 dose of 2.38 mg per level. Numerous reports of atlantooccipital dislocations (AODs) have been described in frontal impacts and vehicle versus pedestrian collisions. Reports of survival after AOD in conjunction with side impacts have infrequently been reported in the literature. The objective of this study is to present a case of an AOD from a side impact vehicle collision, and deduce the mechanism of injury. A clinical and biomechanical reconstruction of the collision was performed to investigate the mechanism of the dislocation. A 51-year-old female was traveling in a four-door sedan and sustained a side impact collision with a compact pickup truck. At the time of extrication, the patient was neurologically intact with a Glasgow Coma Scale score of 15. 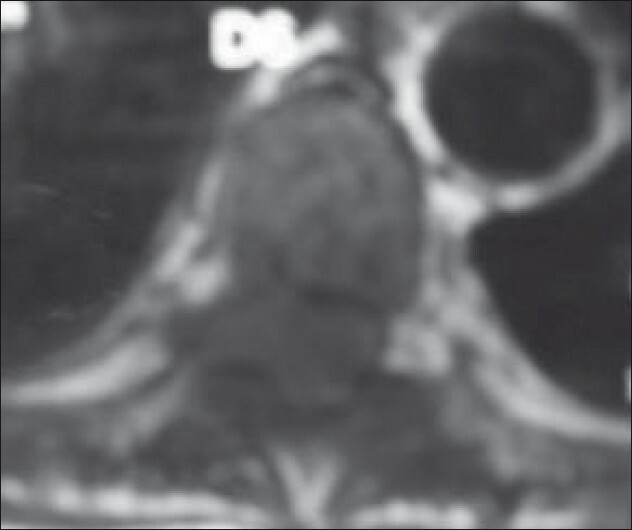 After admittance to the hospital, the patient developed a decline in respiratory status, right mild hemiparesis, and left sixth-nerve palsy, and magnetic resonance imaging (MRI) and computed tomography (CT) reconstructions indicated a craniocervical dislocation. Surgical fixation was performed and all extra-axial hemorrhaging was evacuated. At discharge, the patient was neurologically intact on the left side, had right mild hemiparesis, left sixth-nerve palsy, and minor dysarthria. Survival rates of AODs have recently been increasing. Morbidity is still more prevalent, however. Due to the variety of symptoms that accompany AODs and the inconsistency of diagnostic imaging techniques, a thorough history of the etiology may lead to increased clinical suspicion of this injury and further raise survival rates. Vertebroplasty of the axis is a challenging procedure, and little is known about its therapeutic outcome. Cervical fibrous dysplasia with a distinct cyst is a rare entity and few cases have been reported in the literature. A 55-year-old man with fibrous dysplasia of axis presented with severe neck pain and left arm since six months. Computed tomography and magnetic resonance imaging revealed an expansile, destructive lesion involving the axis, and no spinal cord. He was submitted to retropharyngeal surgery and the lesion was fulled by vertebroplasty. Microscopic examination was consistent with the diagnosis of monostotic fibrous dysplasia. After the surgery no recurrence was observed. The patient had remarkable improvement in clinical relief of neck pain at 1-year follow-up. Although there are descriptions of vertebral fibrous dysplasia, this is the 13th case of monostotic fibrous dysplasia of the cervical spine, and the 3rd case of the axis described in the literature. 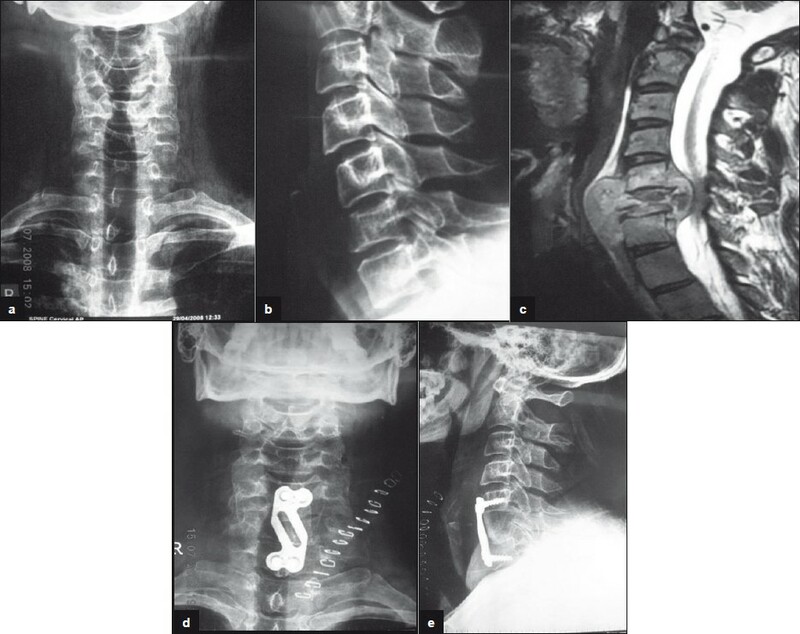 The unique case who had treated with ope vertebroplasty. A 61-year-old female patient presented with diffuse pain in the dorsal region of the back of 3 months duration. The magnetic resonance imaging showed an extramedullary, extradural space occupative lesion on the right side of the spinal canal from D5 to D7 vertebral levels. The mass was well marginated and there was no bone involvement. Compression of the adjacent thecal sac was observed, with displacement to the left side. Radiological differential diagnosis included nerve sheath tumor and meningioma. The patient underwent D6 hemilaminectomy under general anesthesia. Intraoperatively, the tumor was purely extradural in location with mild extension into the right foramina. No attachment to the nerves or dura was found. Total excision of the extradural compressing mass was possible as there were preserved planes all around. Histopathology revealed cavernous hemangioma. As illustrated in our case, purely epidural hemangiomas, although uncommon, ought to be considered in the differential diagnosis of spinal epidural soft tissue masses. 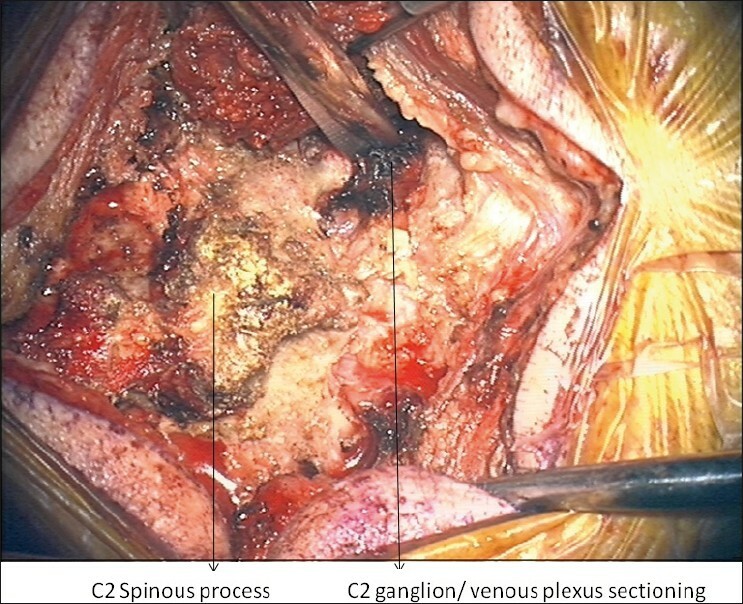 Findings that may help to differentiate this lesion from the ubiquitous disk prolapse, more common meningiomas and nerve sheath tumors are its ovoid shape, uniform T2 hyperintense signal and lack of anatomic connection with the neighboring intervertebral disk or the exiting nerve root. Entirely extradural lesions with no bone involvement are rare and represent about 12% of all intraspinal hemangiomas. Glioblastoma multiforme is the most common malignant brain tumor in adults. Metastasis of intracranial glioblastoma via the cerebrospinal fluid to the spine is a rare occurrence. We present two cases of glioblastoma multiforme with spinal leptomeningeal spread who presented with back pain and paraparesis.